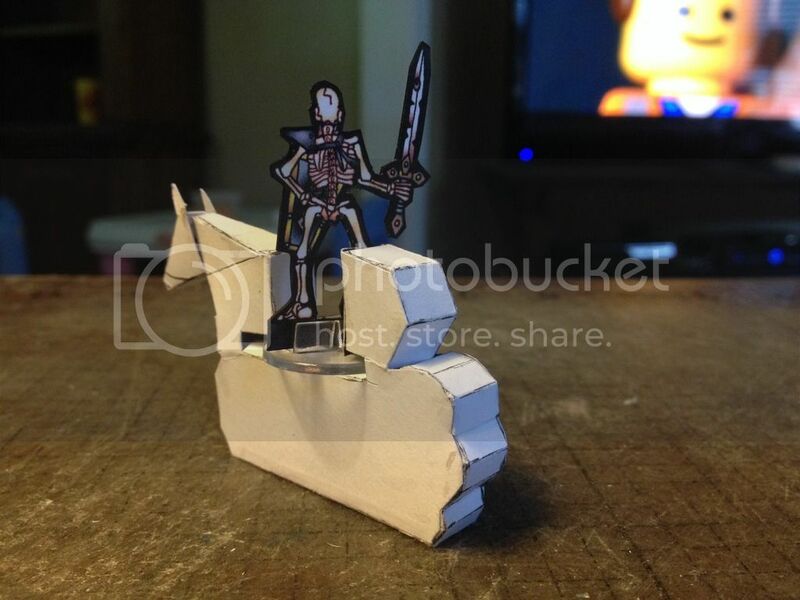 Kitbash prototyping: Rideable Horse challenge. 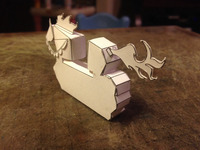 On the Kitbash Prototyping: Ridable motorcycle minis thread, cowboyleland threw down the gauntlet for a rideable horse mini similar in nature. 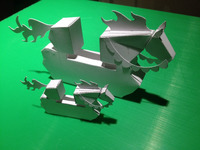 @eddnick's models are pretty amazing, but are very fragile. If you are staring with that, you'll be adding a lot of structure. I actually started on the same project tonight while at work. It looks a bit of a mess now but I'll put it together once I get home and have a chance to scan what I've got so far. It's a very similar style to the motorcycle but I'm going to use a dust cloud to make up for stability and the leg issues. I think you may be better off with a modified 2d horse. Modified by using a layer of notepad backing sandwiched between the two halves of the horse. Not much different than the Litko horses. I'm not a very visual person, so I don't get this description. 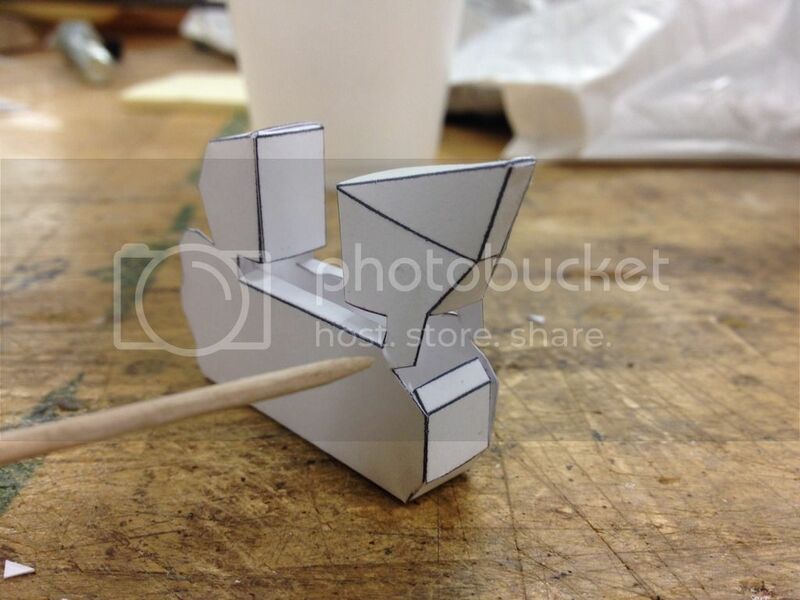 Could you make a sketch or a rough prototype? Glued the two images to notepad backing cardboard. 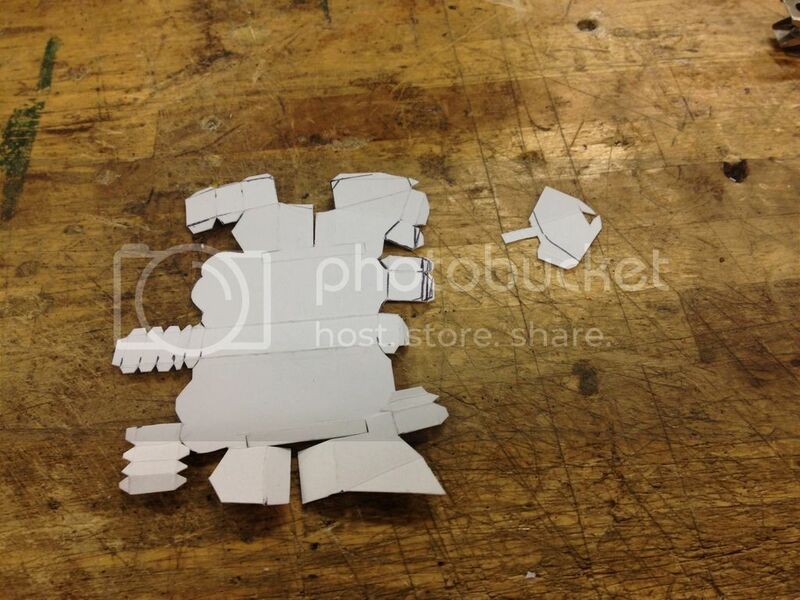 Cut out the two images and glued them together and cut out the 'T' shape. Underestimated the size needed for the base, so had to snip a bit off the rider. 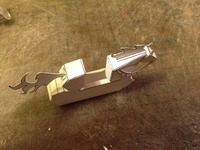 Also glued the heavy card supports to each side of the horse to support the figure. And here's the guy on his horse. I did a lousy job of gluing and cutting and didn't edge at all. Just illustrating a concept. If you were to design a horse mini with this goal in mind, I think it could work well. It isn't that much different than somewhere else in this forum where someone cut slits in the horses to allow a non-bases figure to be slid into place. berneart76 I'd say it is a good start. Now, back to that instruction book! Vermin King That is one solution, but I do not find it visually appealing. The litco markers have the same draw back, though yours looks better than theirs. 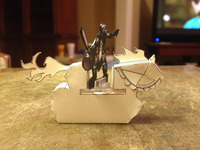 Your design suggests that if you know the rider is going to be a paper fig, you can get away with a very small slot. Glad to hear the instructions are coming along berneart76. 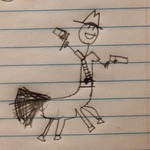 cowboycentaur You are the one whose "good start" I wanted to encourage. here's some stuff i fiddled around with in gimp, still needs a lot of work. 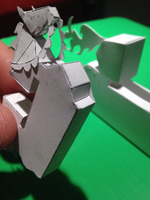 I think that a paper figure version and a non-paper figure version should be considered. Horses, cycles, and whatever other types of mounts could look really good and be easy to use. If the gap to allow based figures is positioned below the belly of the horse or under the chassis of the cycle, I think they could be visually appealing. Designing towards this end rather than modifying an existing model would probably be the most successful. Cowboy is probably on the right track. Come up with a good design, then do the artwork. Had to hurry to get what I had finished so I could print off a sheet to fool with while I'm at work tonight. 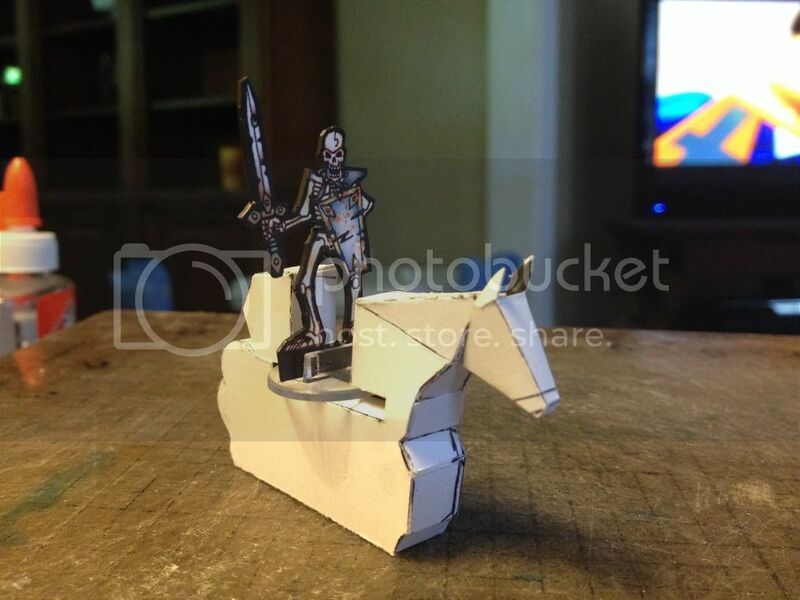 For differentiating between a paper mini rider and a more standard style one the mount model could have an extra layer to adjust for this. Or, as I'm considering doing have a sort of "plug" to go in the back when the mount doesn't have a rider kind of like a Lego horse. berneart76 can't wait to see what model you come up with! Variety is the spice of life! Edit: after first test assembly I see I forgot to finish a few parts. Also, there's a real weak spot near the front where the toothpick is pointing. I think I can solve this by moving the position I had earlier envisioned for the front legs. got a bit more done on my horse, will do another test build once i wake up. bodys missing several parts i think. hopefully the head works. I liked your "plug" idea for when the horse was dismounted, but now I'm thinking "Why not a "horse blanket" to cover the hole when no one is on?" I like that. I'm also thinking of maybe some slip on barding (horse armor) sure either art or maybe a layer would be nice, but I think it's possible it would appeal to someone who likes elaborately detailed stuff like me as an additional option. okay, i think ive got the basic idea down, gotta try and put this thing together and hope it doesnt explode. added some mane, tail and bridle reins just because. Fiddled with a few things and I think i may have a better version here, will try another test build tomorrow. anyone wants to give it a go feel free! 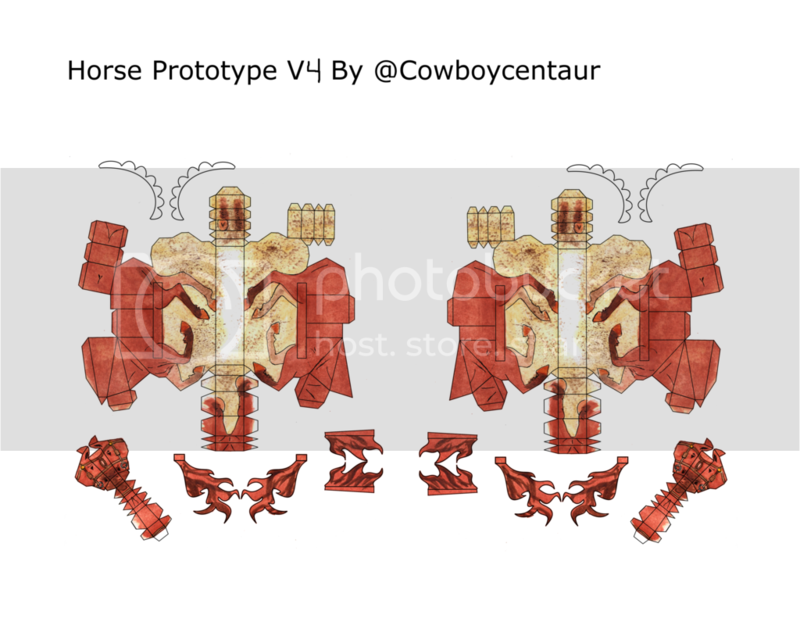 Made a much larger version of horse 3.0 to make doing the initial artwork a bit easier. Front end needs a slight bit of tuning, and I'm not quite happy with the tails overall shape but I think for the most part it's ready to go. 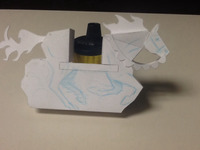 Some blurry beginnings of a sketchy steed. Nah my lovely bride was already getting annoyed that I was staying up past midnight working on it and I'm going to be gone all day at work and meetings afterward, Lol. 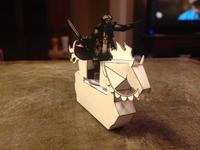 Real life's getting in the way of my papercrafting. 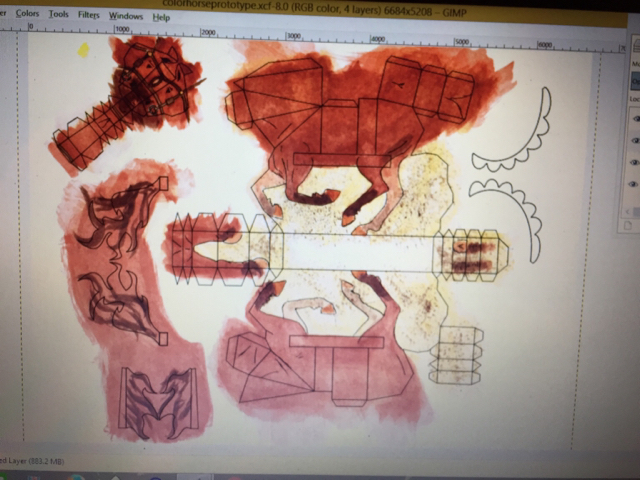 I think Vermin King was referring to your water coloured prototype. 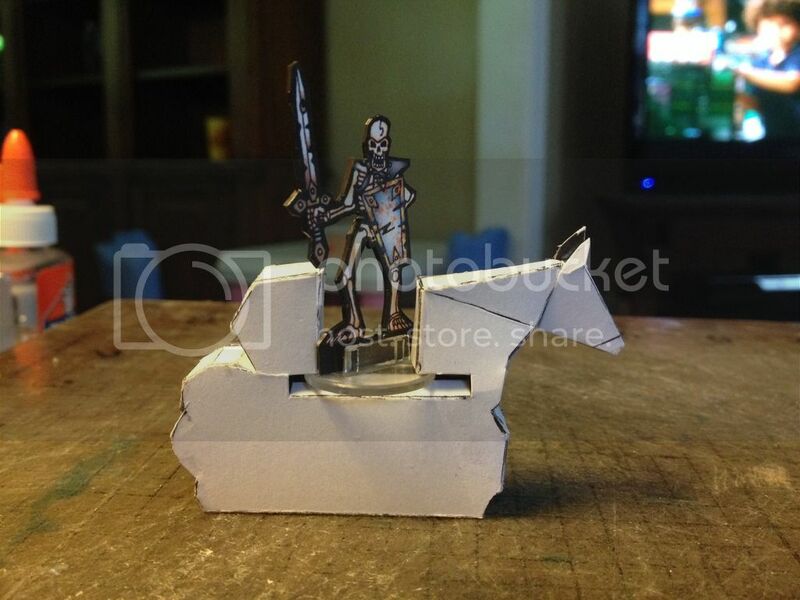 I find painting prototypes a good way to save on ink while doing the rough drafts. It also means you have several usable versions ready for play by the time you have it figured out. Oh, my bad, no I used watercolors because I liked the look then I just slapped the fold/cutlines in layers. I wanted a light watercolor look so it's not too dark when printed. okay, far from a final version, but im wondering how this looks if anyone wants to give it a shot putting it together.